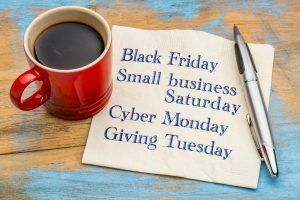 Following popular holiday retail events Black Friday and Cyber Monday, Giving Tuesday is celebrated on the Tuesday following Thanksgiving. The global day of giving serves as the launch of the charitable season when families, friends, and co-workers join together to give back to their communities. Giving Tuesday makes it easy to get involved by suggesting several ways to make a difference in time for the holidays. A great way to get involved is in your own community is by coming together with members of your family, company, or organization and volunteering your time at a local food pantry or homeless shelter. Such programs are always in need of help serving dinners or stocking shelves with canned goods and non-perishable food. Giving Tuesday is fueled by the power of social media and collaboration. Those with musical talent can organize a concert or holiday event with proceeds benefitting a local charity, and an individual with a sizable online following can help spread the word about the upcoming charitable event. Because the holiday season is a busy time, a convenient way for many to give back is through financial donation. A monetary gift can go a long way toward strengthening communities by providing much-needed resources. Giving Tuesday provides a directory to help you locate organizations, events, and charities in your community that accept donations. The generous donations made to The Jobs Partnership has helped transform the lives and careers of thousands of graduates across Central Florida. Thanks to the giving spirit of our valued financial partners, our LifeWorks Training program has been able to equip our students with the skills needed to secure sustainable, better-paying jobs. As part of our expanding efforts to strengthen Central Florida communities, we are proud to announce that we are partnering with the Giving Tuesday movement. Join us this Tuesday, November 27, 2018, in helping the less fortunate find a better path for life and work. If you’d like to contribute to our mission, visit our donation page. Together, we can make a difference.